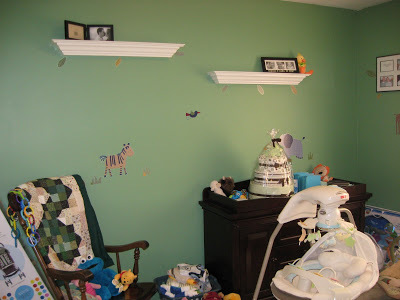 Just a little over ten years ago we decided on a nursery theme for our babies. We picked something that didn’t have any pre-determined gender bias–the jungle. We registered for all of the items in the theme and what we didn’t get at the baby showers, we bought. 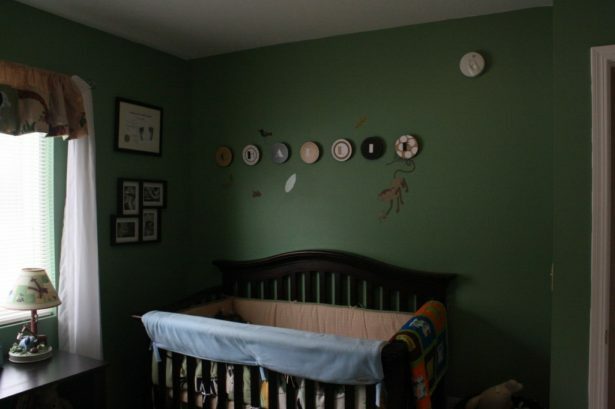 It wasn’t a necessity, I know, but it was cute and it made everything feel like it worked together as our baby’s room. 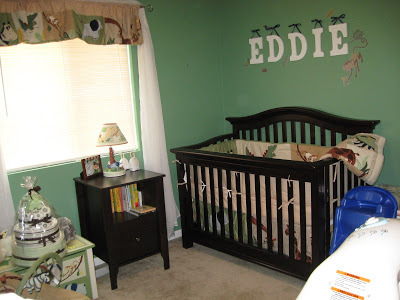 For each baby, the nursery stayed pretty much the same but for a couple minor changes to make it personalized to each kid. It was the cutest little nursery ever. Even when I found out Alice was a girl, I didn’t want to change it. I just loved those animals welcoming my baby. The little elephant on the wall by the changing table was each of my baby’s first “friend” who they smiled and babbled to. I rocked each baby to sleep in that jungle room. 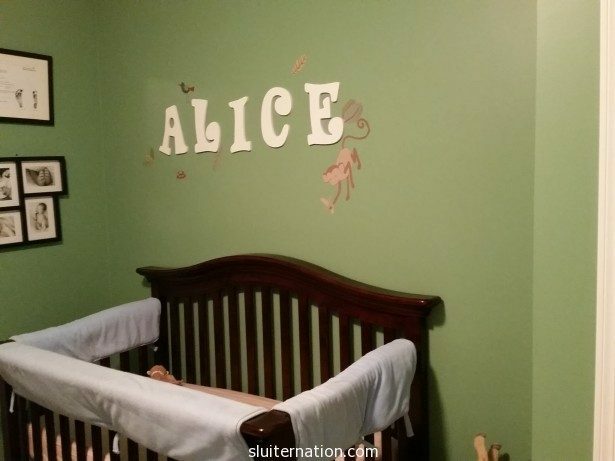 So you can imagine that when Alice started dropping not-so-subtle hints (Mom, I want pink walls. Not green animal walls), my heart sank a little. The crib is now a bed. Alice is out of diapers. And now she wants the traces of nursery vanished. When I first sarted putting away the tiny baby stuff like the crib bedding, I put it all in Alice’s closet with the idea that I didn’t think I could actually get rid of it. I just couldn’t pack it up and drop it off for donation somewhere, even though I knew I should. It was too personal. Too close. Last weekend, Alice asked me to please get her unicorns and mermaids for her room. And pink walls. I told her that when she is four (in March), we would redecorate her room. I sat in the jungle room and wondered what would become of our beloved nursery. Then Cortney suggested that our cousin (on his side of the family), may need nursery things for her baby who was due any time. So I reached out, and sure enough, she could use it. 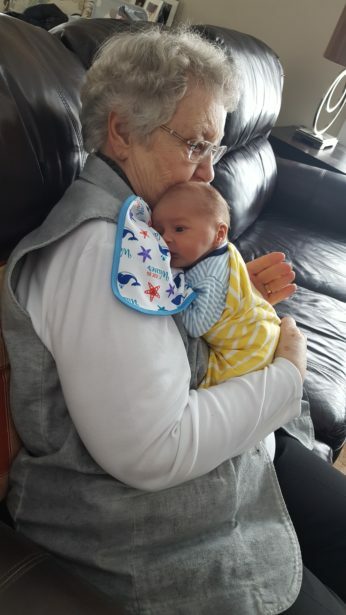 This weekend that tiny beautiful baby was born, and went home today. After church we packed up the nursery stuff and headed over. My heart filled with joy and I knew it was in the right place. Seeing all the nursery stuff being opened and loved made me happy, but more importantly, it will be loved and used by someone we love very much. I hope Katelyn and Karter enjoy talking about and to the animals as much as my children did. I hope the light from the lamp falls softly in the night as a pacifier is replaced or a reassuring kiss and hug are given. I hope the sheets and bedding are as cozy as they were for Eddie, Charlie, and Alice. I hope it nourishes comfort and love like it did for us. It’s a President’s Day Miracle! This was the scene today at our house when Cortney came home from work for lunch. That is the UPS freight guy bringing us our President’s Day gift: Ed’s furniture! Yes, it’s all still in boxes in the garage, so you’ll just have to be patient to see what it looks like all assembled and in place. I had the day off today for mid-winter break, so I cleaned everything that I could out of Eddie’s room and made piles of heavy stuff for Cort to bring downstairs. Now it’s in Cort’s hands. He is in charge of the heavy lifting and cleaning the carpets and then the assembly of the furniture. I think he’s almost as excited as I am about all this new stuff, so he will probably make good on getting some (or all) of that done within the next week…and you KNOW I will keep you posted with pics!